This season, collect your nuts the easy way-- using the 12" Bag-A-Nut Harvester! No bending down! No crawling around for nuts! 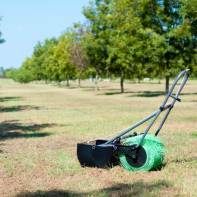 Just roll the lightweight nut roller over any type of ground (uneven? No problem!) and watch as the magic fingers grab your nuts and push into the collection basket. Quick! Easy! Fun! The 12' Nut Roller grabs a wide variety of nuts based upon your needs. Pecans, Almonds, Large Acorns, Small Acorns, English Walnuts, Macadamia Nuts, Sweet Gum Balls, Joba Beans, Black Walnuts, and Burr Oak Acorns. You've got nuts? We've got the solution! Size 3/8" to 1 1/4" is ideal for Pecans, Almonds, and Large Acorns. Size 5/8" to 1 1/2" is ideal for English Walnuts, Macadamia Nuts, and Sweet Gum Balls. Size 1/4" to 1" is ideal for Small Acorns and Joba Beans. Size 1 1/2" to 2" is ideal for Black Walnuts, Burr Oak Acorns, and Golf Balls.